This topic has been on my mind for a while now. A long while. I don't understand why so many people have a problem with so-called labels when it comes to kids' illnesses or disorders. Why are you calling a diagnosis a label? If my child has a cancer or flu, should I rush away from the doctor's office proclaiming, "I won't have my child labeled?" No. Instead, I take the information, learn about the causes and symptoms, and then I work toward helping my child get better. Why is it different for other illnesses or disorders? 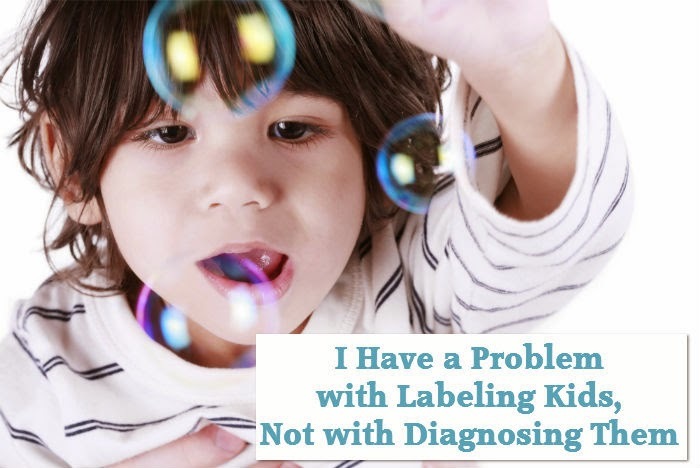 Why do we call those labels rather than diagnoses? Label: a small piece of paper, fabric, plastic, or similar material attached to an object and giving information about it. There is no such thing on my child. There is no piece of paper or plastic attached to her, that could tell you all you need to know about her. There is nothing in her diagnosis that gives you any real information about her, either. "She has the flu" does not tell you who she is. "She has bipolar disorder" doesn't either. You don't need a label to know about her anyway. I can tell you about her. Better yet, you could simply get to know her. If I tell you, "My child is a girl," what have I told you? Not much. If I tell you, "My child is artistic, soft-hearted, and loving," I've told you a bit more, but you still don't have all the information about her to truly know who she is as a person. If I tell you, "She has bipolar disorder," the same applies. I've given you one piece of information. What does that even say to you? Nothing if you have no knowledge of bipolar disorder, and very little if you do. Certainly none of these clearly defines my child to others, or even to her. She is so much more than these words. In all of my education on child development and parenting, and in 25+ years of teaching parenting, never have I heard the word label applied to a diagnosis. However, there is a form of labeling that is often discussed. This type of labeling is what is detrimental to children. Like a label made of plastic or paper, these words do give information about the child. In may be incorrect information, but it clearly defines who that child is, to others and himself. He is lazy and stupid. In the end, the child will grow to define himself by these words. This unrealistic view of himself will have a detrimental impact on his life. He will likely live down to those expectations. He may become these things because he was labeled. In contrast to labels, a diagnosis doesn't define my child. It doesn't have a detrimental impact. It will not affect her ability to see herself realistically, or cause her to become less than she is capable. If I tell my child she has diabetes, will she believe that? I hope so. Will it have a negative effect on her self-image? No. Hopefully it would prompt her to learn about her illness. Then she can manage her diet and medications to prevent or slow down the progression of the illness. Why is that any different for a child with bipolar disorder, autism, no legs, no sight, or no hearing? Aren't we simply equipping them with a diagnosis that will help them manage their life so they can function better? Wait! Did I just include missing limbs and blindness in the same category with bipolar disorder? Yes, I did. They're all obstacles, none of which define the person. We don't hide from the diagnosis of blindness, do we? So why hide from any other diagnosis? I can attest that my life and the lives of my children have improved greatly since we learned we have Asperger's. It was life-changing! How Can We Help If We Turn a Blind Eye? Let's say my child has diabetes. I can learn about the symptoms. Then when I see those symptoms flaring up, I can do something. Is her vision blurring? Then either she needs to eat or she ate too many carbs. I can counteract the symptom by feeding her or giving her meds (or high protein). It's the same for my child with bipolar disorder. If I didn't accept the diagnosis, I wouldn't learn the symptoms. I wouldn't know that her pale lips and rapid speech means there's about to be an onset of rage or mania. Because I do know these things, I can feed her protein, give her extra affection, and try to calm her before her mood is out of control. How can I help her if I refuse to accept the truth? Flu. Colds. Diabetes. Cancer. Blindness. Cerebral Palsy. Multiple sclerosis. The list is long, but my point is the same on all counts. These are not labels. They are legitimate diagnoses which require treatment (what type of treatment is up to each family), special care, and support. I don't understand why that's upsetting. I could be missing something, but I doubt it. Feel free to inform me if you have better information. I am always open to new thoughts and perspectives. Until I see something differently, I will continue to see a diagnosis as a helpful thing. By calling it a label, and fearing that label, we add to the stigma which is already so prevalent. Want to see more posts on parenting special needs kids? Subscribe here and I'll send them straight to your inbox! I agree with you. Diagnoses help us parent the kids we have. I do have an issue with people referring to children with 'labels first' - Down's Kids, Aspies, my adopted son - I have an acquaintance who referred to her daughter on social media as her 'albino'. When a parent does this, I think they send the message of how to view their child - diagnoses or label first. They are kids who have these labels - but should not be defined by them. I do not think you do that here, and I think your assessment is correct. Finding out what is causing our childrens' difficulties can only help us help them. I agree with what you're saying and I can't believe the albino remark. However, in our house, aspie and bipolar bear are loving, fun terms. I am an aspie and have no problem calling myself that. I think this is a brilliant blog. My son has SPD I only tell people when we're in a play group setting and I watch to look for signs of a sensory meltdown. I regulate him and prepare him for everything before hand as well. Sometimes I get funny looks, and other times I have a parent say thank you for letting me know. Others are curious and what to know more about it. He has SPD and yes it's a label but it doesn't define his whole makeup as a person. I call him my sensory kiddo or when he's stimming I'll say "sensory powers activate." I say it in a joking way and with love. That's great, Jeanine! We use humor around here, also. We make jokes about the bipolar bears hibernating or how we must feed the bears so they don't get moody. It's all in love. In fact, my kids are the ones who began referring to themselves as bipolar bears, Alexis, who is sometimes called Lexi and has dyslexia, nicknamed herself "Dyslexi" when she as younger. She also refers to her bipolar-ness as being a ninja. When someone asks why she can't sleep or about something else related to bipolar disorder, she says "Because I'm a Ninja." Very intresting perspective, i've not quite thought about it this way. I don't like the idea of labelling people anyone, i think people are way more than the boxes they're put into. Even then, it's good to distinguish between diagnosis and the idea of labelling. Thanks for getting me thinking. Mo, Thanks for your comment. I don't like labeling people, either. I also don't particularly like not treating a child (whatever treatment one chooses) for things that seriously impact their lives. I don't think it's fair to them. The problem is that when we talk about words like Lazy, Stupid, Useless, Worthless, etc., we also should extend that to the words originating in the psychiatry field, like "retarded" or "idiot". They used to be an actual diagnosis a generation ago. Now the same is happening to the words "autistic", or "hyper", or "(smelling of) Ritalin", which is just another way of saying well... "useless". Yes, us, special needs parents, are not in that boat, the problem is that the rest of the society does not care. I agree. Retarded, autistic, bipolar, OCD.... People really need to stop misusing these words.